Abu Dhabi: Before beginning daily training, 10 teenagers in Bangladesh’s Special Olympics volleyball team would spend up to an hour clearing the dirt grounds that served as their training base for the past two months. 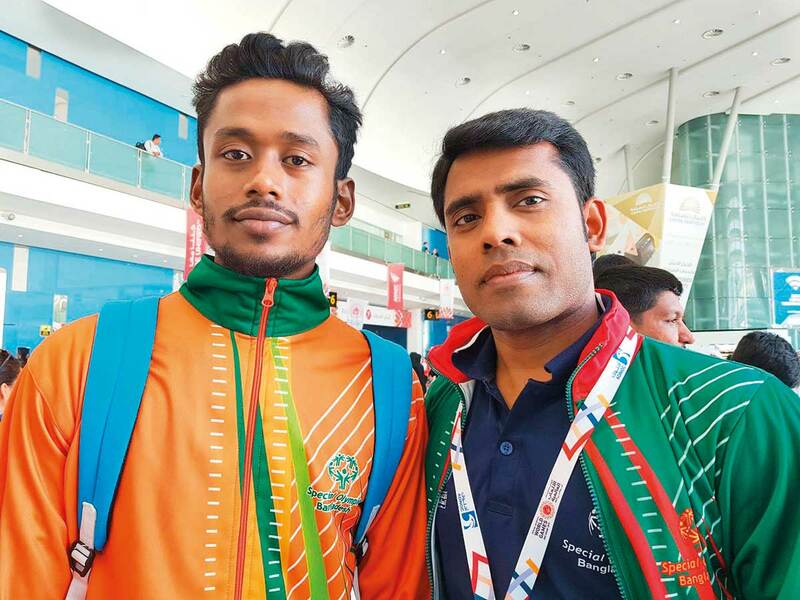 This level of dedication and enthusiasm is often not present in athletes without disability, said Suhail Rana, volleyball coach for the Bangladeshi team at the Special Olympics World Games in Abu Dhabi this week. “It was hot and dusty, but the team never complained. Their joy at a single good volley is also unparalleled. And when you look carefully, you’ll see how athletes with determination support one another when they play as part of a team, instead of looking for individual glory,” Rana told Gulf News. Indeed, while it often takes athletes with determination longer to master a sport or learn its rules, coaches said that they stay more focused over time, without allowing losses to deter them. “Many young people who take up a sport do it is as a whim, or because their parents would like them to play. In contrast, I’ve found that athletes with determination take greater joy in participating,” added Roger Nyberg, head coach of the Finnish tennis team at the Special Olympics. Nyberg has been a coach for nearly 35 years, and runs a tennis school in Finland. He was accompanying Sanna Laura Sepponen, 41, a tennis player with determination. “[What I also love] about working with special needs athletes is that they do not view a medal as the end. Many have come to the Special Olympics, and they will go back home and continue to cultivate their passions,” said Nyberg. 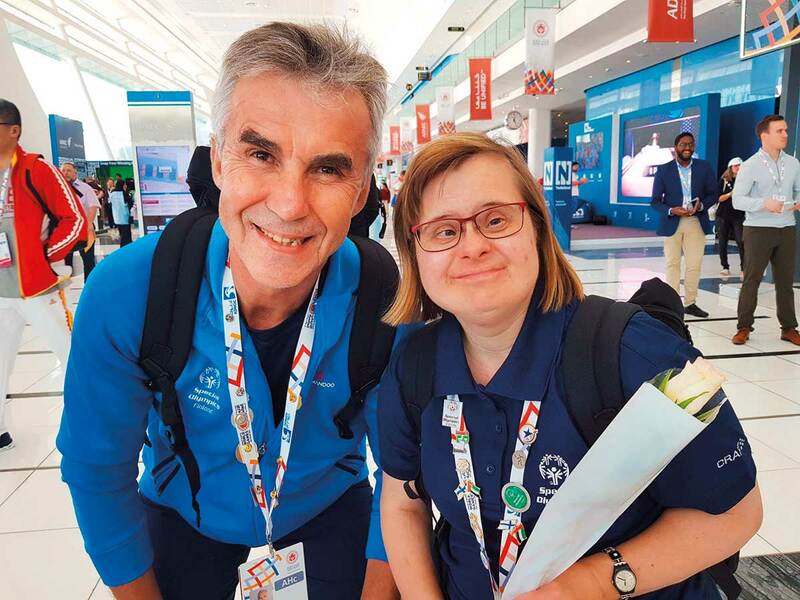 This enthusiasm was palpable on the sixth day of the Special Olympics World Games, with many teams remaining upbeat even as they failed to reach the final stages of their respective competitions. Regardless of the results, athletes gathered with their teammates and coaches after the matches, patting each other on the back before grabbing a snack or engaging in workshops at the venues. “It does take longer to train a team with special needs athletes, especially as you have to pay special attention to each individual player. For instance, we trained for two hours at a time five days a week to be prepared for this competition,” said Ahmad Abdul Fattah, coach for the Sudanese volleyball team. “But now, the players interact really well with one another, and there is a special sense of accomplishment in seeing that,” he added. I miss my parents because they are not here with me. But I’ve enjoyed the food and activities here so much that I don’t think I want to go back. We came away with a bronze medal, so I do wish we had been able to progress further. But I am also happy that we were able to get this far, given that we were the youngest team in the competition. I have been playing tennis for nine years, and it helps keep me fit. Even after these Games, I will continue playing the sport because I really enjoy it.